The public is invited to view an ongoing exhibition of the work of artist Tim Williams in 2013. Boonville resident Tim Williams (1953-2011) was a prolific artist in a wide variety of media: oil, watercolor, pastel and pencil. Because he rarely exhibited his work this posthumous exhibit provides a way to see the wide sampling of his art, including many done in and around Boonville. It is also an opportunity to meet his widow, Jane Lago. Williams has been described as “a tireless seeker, a fearless innovator, and an extremely sensitive artist.” He died suddenly Dec. 19, 2011, at the age of 58. This collection is only a part of a vast body of work that he created in his last twenty years. Tim did not begin his career as an artist until his 40s. As a practicing Buddhist, Tim annually went to Japan to meditate with other Buddhists. One day his Zen master asked him to illustrate a book of his talks. Tim’s response was “But I’m not an Artist!” The Master responded, “Oh but you are!” So in the early 90’s Tim decided to go back to school to pursue an art degree at the University of Missouri, which he completed in 1996. Like so many other area artists, his mentor was Frank Stack. 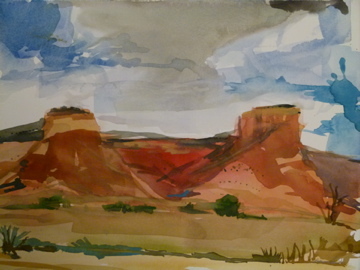 He would travel to surrounding river towns with Frank, and sometimes other plein air painters, including Jane Mudd, Byron Smith and Chris Teeter. He communed with fellow artists, nature, and quickly gained an understanding of painting from life. He had a natural, raw, talent that amazed and inspired all who knew him. Tim was also influenced by MU Professors Jennifer Wiggs and Jo Stealey . He was passionate about art history and collected many art books. After he and his wife, Jane Lago, bought a house in Boonville overlooking the Missouri River, his desire for making art intensified, and he set the goal of painting a portrait a day. This exhibit may be the final show in the Zuzak Wonder Store’s gallery and will run at least through April 14th, 2013. The gallery opened its doors in April of 2010 and exhibited the work of many artists from the Boonslick region and beyond. Both artists and the general public are encouraged to come celebrate the past three years of sharing art in the Zuzak on Sunday, April 14th, from 2 - 6 p.m., or so? The exhibit “Steaming Up River” features over 20 of Gary Lucy's limited-edition signed & numbered prints, and will be in the gallery for an extended period during 2013. Growing up in the Missouri boot heel, Gary Lucy never envisioned a life in art. Starting college at Southeast Missouri State University in 1967, Lucy’s goal was to get his CPA with a degree in marketing and advertising. A career in business seemed a logical and sensible choice. However, Lucy’s career path changed direction after an invitation to take a drawing class with a friend. “It’s kind of interesting how one little event can change your life,” Lucy said. Though he took the drawing class as a means to give his mind a break—a grown up kind of recess, Lucy discovered a love and aptitude for the work, and he began researching a change in major. In the end, Lucy decided that teaching art would be the best for him, allowing him to pursue his interests and still pay his bills. After graduation, Lucy taught elementary art for one year in the Washington, Missouri School District, but the desire to earn a living as a full time artist pulled at him. During his senior year of college, as president of the art club, Lucy arranged for a club meeting at the home of a metal sculptor who had recently moved into the area. Passing through the artist’s carport on the way to his studio, Lucy noticed a Corvette sitting next to a pickup truck. During the course of the evening, Lucy had the opportunity to ask the artist, “Do you truly make your living as an artist, and do you make enough money to pay for that Corvette?” The artist’s answer was a simple yes. It was a moment of epiphany for Lucy. At that moment he knew if that artist could make a living solely off his art, he could too. After only one year of teaching, Lucy was ready to try his hand as a professional artist. The year 2004 was the culmination of 20 years of loving work and painstaking research for Lucy. Coinciding with the 200th anniversary celebration of the Louisiana Purchase, Lucy returned to the old courthouse in downtown St. Louis with 82 original paintings for his exhibit “Inland Waterways: The Highways of Our Heritage.”Included in the exhibit were 8 paintings of the journey of Lewis and Clark that have been reprinted over 225 million times worldwide. From 2004 to 2007, Lucy’s next project was a mural “Inland Waterways: The Highways of Our Heritage” for Southeast Missouri State University for the Holland School of Visual and Performing Arts. Gary Lucy continues to pursue his art up and down the river and into the pages of the past. The River Rover, a 35 foot houseboat converted into a studio, makes a great escape for him to paint, read, write about current works, and simply enjoy the river. His canine pet Petie keeps him company along the way. Gary Lucy resides in Washington, MO above the gallery run by his wife, Sandy.
" I can’t say that I was drawn by a certain art medium to express my creative voice, or that I had a great calling to be an artist. Crafting things just always seemed to make more sense to me than anything else. Integrity dwells in the doing. I am the second generation of Czech immigrants and was raised outside of Chicago surrounded by virgin prairie purchased by my great-grandmother. The men in my family were bricklayers, machinists, welders, and carpenters, while the women were factory workers, shop keepers, and excellent bakers and cooks. We didn’t go to the theater, political rallies, or church. We made things. And we gathered around the table laden with delectable dishes and swapped stories. We laughed until we cried and if needed, cried until we laughed. For outside entertainment, we went to the movie theaters, Brookfield Zoo or the Field Museum. Sometimes we took the commuter train into the city and went to the Goodman Theater for marionette puppet opera. If there was a parade in town, we were there. Our passions were released under the big top of the Ringling Brothers/Barnum & Bailey Circus. 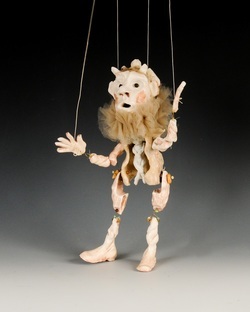 After college, I spent a considerable part of my life raising four children, keeping a large country home, and attending to a marriage for 24 years all the while building the Koonseberry Puppet Theater. Through the art of the puppet, I explored the dimensions of film, acting, set design, sculpting, teaching, and perhaps most importantly, collaboration. My work salutes gypsy performers, puppet actors, and circus clowns. By exploring portraiture, direct gaze and gesture, a reverence is cast upon the role story plays to re-connect the marginalized, thereby leading us to a place where recovery and redemption seem possible." This show exhibits the growth and change of 30 advanced art students over the past year. It is always rewarding to observe students evolve and change with their art. I encourage my students to take risks and experiment with new ideas and media, to think outside of their comfort zone. The art exhibit this year shows a wide variety of themes and media. Senior Art Portfolio students continued the tradition of creating a Black and White Drawing of a building around the Boonville area. The places represented this year include; the MKT caboose, Zuzak, Boonslick YMCA, Victorian home, St. Peter and Paul School and Ravenswood. You can purchase 5”x7” matted prints of the drawings for $5.00 at the Zuzak during the show. Taylor’s Bakery will have other sizes available as well as postcards after the show. Batiks, an overall favorite media for my advanced students, are wide and varied in the exhibit. It is always fun to see the growth that students show in their understanding of the Batik process from the first time they try it as Art II students and then the experimentation that is done with Art III and Art Portfolio Students once they have a good understanding of how the whole process works. Students also created Cat and Dog Artwork for the Boonville Animal Shelter Auction. The artwork will be a part of an auction held to raise money for the shelter later this spring. Many students used their own pets as subject matter for this project. Aluminum Foil Relief Art is also a part of the artwork in this year’s exhibit. This project used a combination of very thick cardboard (thanks to Nordyne), Elmer’s glue, heavy-duty aluminum foil, oil paint and India ink. The impression given by this media is that of embossed metal. The Pottery displayed is a combination of coil- constructed candle holders made by Art II students and slab-constructed underwater sea life created by Art III students. Advanced students practice the technique of throwing on the wheel for approximately two weeks each year. The cups and bowls on display are the results of their attempts at this challenging pottery method. doors, with minor touch ups to be done indoors. My preferred medium is watercolor, but I also paint in casein and oil on board or on canvas, which I stretch myself. I paint with a brush but use a pallet knife when I wish to be expressive. My pallet is vividly covered with yellow ocher and umber, to cadmium ed, to the blues- prussian, ultramarine, cobalt. My subject is the subtle beauty of the Missouri hills, the magnificence of the Missouri rivers, the richness of Missouri pastures and fields. The Missouri landscape became dear to my heart through my years of growing up enjoying family farms and neighborhoods. I had the pleasure as a youth of exploring the woods of Hinkson and Flatbranch creeks, as well as the rolling farmland of Dear Park and Englewood. The Missouri River Valley, with its vistas of towns and farms, forests and streams, is my endless and ever changing subject. Byron Smith – born 1960 Columbia, MO. Painter, Printmaker. Studied at University of Missouri Columbia Fine Art Department. Co-owner Mythmaker Gallery of Fine Art 1993-1998. Co-owner Grindstone Studio LLC (Printmaking). Member Orr Street Studios- Columbia. Curated exhibitions Gains/Oldham Black Culture Center University of Missouri Columbia. Byron has exhibited locally and regionally. Come explore the art of Keith Young, creator of the collage artworks featured in our guest-artist front gallery, now through August 2012. Keith grew up in Blackwater and Pilot Grove, MO, and will soon graduate from State Fair Community College .